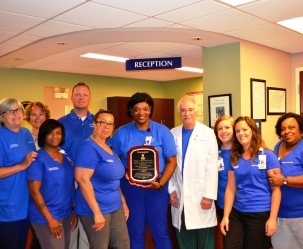 Central Carolina Hospital‘s Wound Care and Hyperbaric Medicine practice has been honored with a national award for continued excellence in wound healing. The Robert A. Warriner III Center of Excellence Award is given to Wound Care Centers® in the Healogics network that have met the highest level of quality standards for a minimum of two consecutive years. Central Carolina Hospital Wound Care and Hyperbaric Center offers highly specialized wound care to patients suffering from diabetic ulcers, pressure ulcers, infections and other chronic wounds which have not healed in a reasonable amount of time. Some of the leading-edge treatments offered at the Wound Care Center include negative pressure wound therapy, debridement, application of cellular-based tissue or skin substitutes to the wound, offloading or total contact casts and hyperbaric oxygen therapy. Healogics, the nation’s leading and largest wound care management company named this award in honor of Dr. Warriner, a pioneer in wound care and the company’s former Chief Medical Officer. CCH was one of 268 centers across the country to be honored with this award in 2018. Medical Director Dr. Michael Gordon notes, “Our staff and physicians, notably including Dr. Todd Brown and Dr. AJ Ajmani, are trained to provide advanced wound care treatment. It is their commitment and dedication to the patients, hospital and community that makes the center successful. We are honored to have been recognized each year for excellence in wound care and patient satisfaction since the wound care clinic opened.